On the evening of November 12th, following a day of Arctic adventure and spotting bears, Dr. Charles Jonkel (“Chuck”) taught us about the relevance of where we were sitting and some critical changes and decisions that will affect the polar bears. Chuck explained that the Polar Basin is actually quite small. We need to do more than we’re doing now to preserve the ecology here. We need to increase awareness and let people know how to impact positive change. The polar bear is particularly vulnerable. It’s a rare example of a terrestrial animal that lives on a food source under the ice – the ringed seal. The polar bear is an animal that depends on 2 totally different environments to survive, which makes it vulnerable in 2 ways: threats to its environment and threats to the environment of its food chain. Chuck spoke about the crucial stretch of the Northwest Passage, which was blocked for 65,000- 100,000 years with old ice, unusable. About 15 years ago Americans discovered the Northwest Passage. 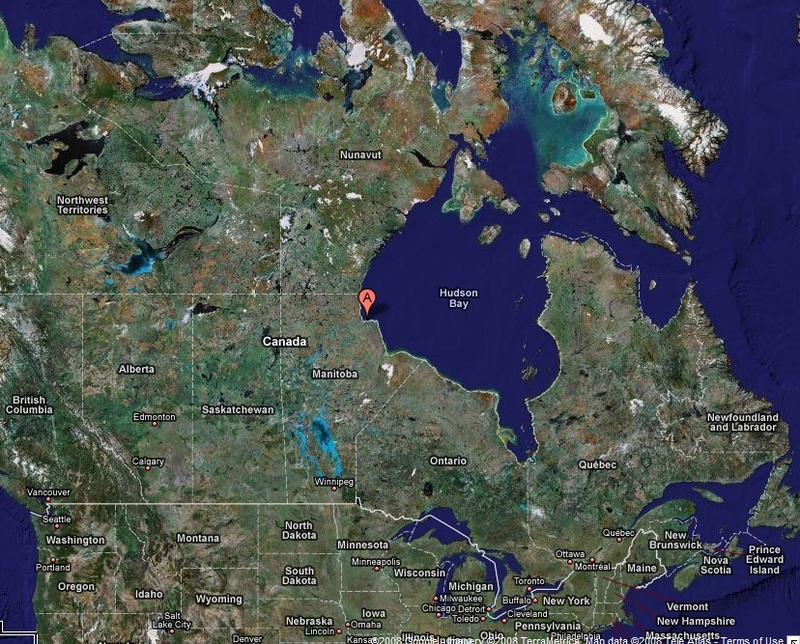 Canada claims the Northwest Passage (including Hudson Bay) belongs to them, but this is in dispute with other countries that border these waters including America and Russia. The ice in the Northwest Passage melted out 3 summers ago, bringing Asia and North America 2,000-4,000 miles closer (because now we can cut straight through, instead of having to go around). This will have a huge impact on shipping industries, importing and exporting. Now there’s major money involved and countries are battling over this region. There are no treaties governing the area yet, but they will be written and countries will be fighting for control. It’s important that we understand the politics at play here because the countries that border this region will have tremendous impact on the Arctic ecology (for better or worse). It’s harder for bears to get to their food source (seals) in Alaska now. Cubs and moms can’t swim 100-125 miles. Jonkel thinks it’s possible there will be no more bears in Alaska in 5 years. The bear population is decreasing in Churchill as well. 10 years ago we would have seen 35 bears today. We saw bears today, but not 35 (approx 8). Last June Russia started drilling off-shore. They hired a company to teach them how to do it (“a non-conscious French company”). They turned down an offer from Chevron who was trying to teach them responsible ways to drill. Instead, they’re working with people who are not concerned about protecting the ecology. Fishing boats are coming in and competing with the polar bear’s foodchain. Millions of dollars are involved in shipping areas so there’s going to be a big fight if we want to regulate this to help preserve the environment. Greenland is 5 times as big as Montana, with 2 miles thick of ice. The ice is melting. Greenland controls what happens with continental glaciacian. We’re at the tail end of the 4th continental ice age. There could be a 5th one. Greenland is functioning as a thermostat – could trigger a 5th ice age. Chuck suggested we continue to learn about this region and pending policies that impact it. He prompted us to write letters to the Russian and Canadian governments. If nothing else, LEARN about it. Chuck said the reason he was “teaching us to talk Arctic” is because when people hear something they don’t understand, they tend to tune it out. He wants us to be familiar with the region, the terminology, the animal and plant life so that we can participate in the discussion. This entry was posted in Polar Bears and tagged Canada, Churchill, Climate Change, Education, global warming, Hudson Bay, Polar Bears. Bookmark the permalink.